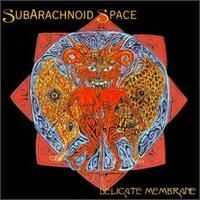 As SUBARACHNOID SPACE's debut album, the sound of "Delicate Membrane" is rather raw. Entirely instrumental, the music can be described as tormented psychedelia driven by distorted guitars. Although the compositions are improvised, they are quite homogeneous and gives the record a dark atmosphere. The first tracks, "Karoshi" and "Don't Look in the Trunk" are dissonant and oppressive. They sometimes resemble early dry gothic rock or cold wave, like BAUHAUS. In contrast, "Talking Tina & Her Mechanical Frog" incorporates other instruments. More delicate and mystical, this track has crystalline sonorities. Good, but a bit too long. "Slow Boat To China" is a great haunting track with didgeridoo and atmospheric guitars, displaying a threatening ambiance. The second half of the record is unfortunately a little less inspired. The incantational "K&V Equals Drool" and "Doomed Megalopolis" are dominated by drums but are a little messy, whereas the slow "Highly Unnatural" is rather chaotic. Then comes the calm and intriguing "Something Wicked" and the ender, the paranoid "Lidocaine". These two last tracks have good moments, but features not many variations and tends to become a bit repetitive. For a debut release, "Delicate Membrane" shows great promises. Despite some lengthy passages and a crude drum sound, the band inaugurates the rather unexplored domain of modern dark psychedelia. At this period, this particular revisitation of this genre was quite unexpected.